Are you in the top 2 percentile? Think you’ve got what it takes to join Mensa? Wanna find if your brain possesses the ninja like intelligence it takes to score high enough on the Mensa IQ exams? Barnstom Games has created the official test app for the American Mensa group which lets you take sample Mensa approved test on your iPhone in your own privacy. The Mensa app has 2 modes. 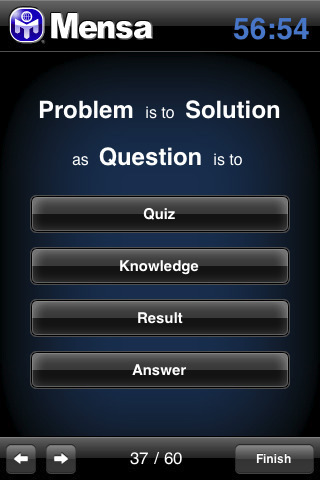 In training mode, you take small 5 minute quizzes including 5 questions. The questions are show on top with multiple choice answer buttons on the bottom. You can skip and come back to any question using navigation buttons or by swiping. Don’t guess because you are penalized for incorrect answers. This is a great app for both Mensa members and new comers looking to join this world renowned organization. You get genuine Mensa questions thrown at you from a variety of topics inlcuding Logic, Mathematics, Language and Visual. Remember, during a real Mensa exam, you can use pencil and paper, but no calculators. After you’ve gone through and gotten a reasonably good score, you can brag about your new certificates by emailing your friends or posting it to Facebook. The Mensa app also keeps a log of your scores for your own records. The app costs $1.99 and is a must have for anyone looking to give their brain a good healthy workout. 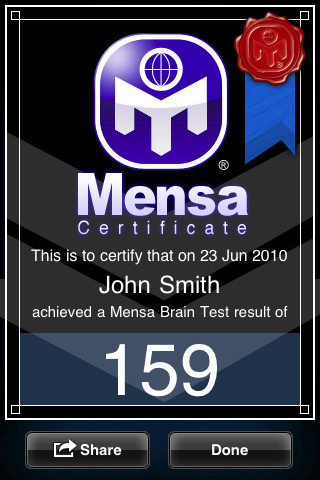 AppSafari review of Mensa Brain Test was written by Joe Seifi on October 21st, 2010 and categorized under App Store, Education, Productivity. Page viewed 5190 times, 3 so far today. Need help on using these apps? Please read the Help Page.